A Master of Orthopaedic Surgery (MCh Orth) Dundee graduate from 2015-2016 was recently the recipient of a two-week Fellowship at the University of Leicester. 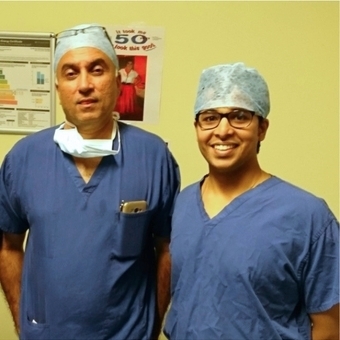 Dr Archit Agarwal, currently working as senior resident in ESIC PGIMER, New Delhi, had the opportunity to attend Leicester General Hospital, England under the direct supervision of Mr Radhakant Pandey (Head of Department of Orthopaedics, University of Leicester, pictured right with Dr Agarwal). This was part of the International Society for Knowledge for Surgeons on Arthroscopy and Arthroplasty (ISKSSA) Fellowships, which were granted in 2016. Dr Agarwal’s MCh (Orth) research was on the comparison of kinematics in gait analysis in total and hemi knee replacement surgery and was supervised by Mr Bill Hadden and Mrs Linda Johnston at the TORT Centre. He was presented with the Department of Orthopaedic & Trauma Surgery’s ‘David Rowley Presentation Skills Award’ from Professor Rami Abboud on May 31st 2016. This prize is awarded annually to the MCh (Orth) degree student who has best presented their research, orally, by power point, and visually via a scientific research poster.